Outgoing Councilman Lonnie Falgout, who lost his bid for re-election, recently took potshots at police by alleging they’ve turned a blind eye to golf cart safety and have even allowed children to be designated drivers for their drinking parents. Seriously folks, I would see kids driving Golf Carts all the time in Ward 1 not that long ago when we lived there along with other spots in town where we’d be out and about, so an earlier story on the topic which made the national media that Cassandra Favre wrote for the Sea Coast Echo sounded much more true to life to me. The story Chief planted in the Sun Herald in late June was in direct response to Cassandra’s. Driving the wrong way on a one way street. “If people have the right safety equipment, insurance and a driver’s license, and the speed limit is low, it’s legal — and they have to follow laws just like other vehicles,” Freeman said. Freeman, who lives downtown, said the golf carts he sees being driven around the tourist areas are being driven safely. 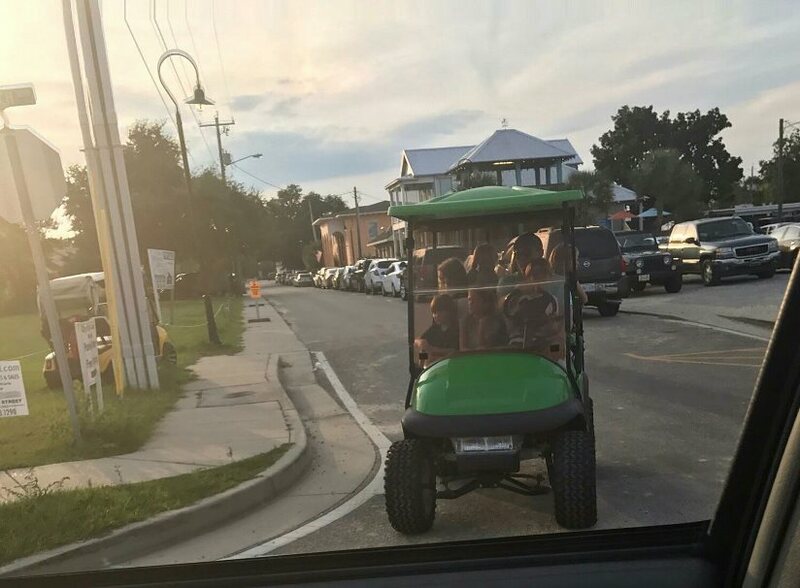 Of course since Bay St Louis is not authorized by law to have golf carts on City streets every Golf Cart Chief Freeman sees is in violation of the law since none of the ones in Bay St Louis have license plates. The planted story was just bad on several levels including the obvious self contradictions. I’ll add that the folks complaining about idiots unsafely driving golf carts the wrong way down one way streets are not kill-joys or assholes or whatever else Chief may term them. One day there will no doubt be an accident with a fatality that could have been avoided had the Bay PD simply done their job. Ignoring a problem is not good policing IMHO, rather its flat out lazy. I’ll end this post with an observation that Wes Muller is still greatly missed on the Hancock County beat. They say a picture is worth a thousand words, so I am speechless. But, I have shown the City Council many other photos that I took myself of the same violations. You know, you could hide a couple of little kids like these on the floor of a car if you ran out of seat belts, but this is so in your face and blatant. Unbelievable. An automobile driver doing this would receive a citation and fine for each unbelted child, and they would probably throw the book at you for that baby sitting in this imbecile’s lap while he’s driving. BAY ST. LOUIS—A PLACE APART!! WHERE FOLLOWING THE LAW IS AN OPTION!! PS: Chief Freeman told the Council last night that he is applying for a “click it or tick it” grant for some $12,000. I hope whomever he applies to is a Slabbed reader!!! Last night, there was an interesting discussion about enforcement of the noise ordinance. It was along these same lines. Cudos to Doug Seal. If we are going to pass an ordinance, we have got to enforce it. It we begin selective enforcement, the lawsuit is just waiting for us. And we have plenty now. Freeman took ego cheap shot because that’s what uninformed do! There’s has been many wrecks, incidents and carelessness the last 8 years! “Unfounded” he stated! Chief, do you really think that people who are involved in these many illegal mishaps over the last 8 years are ACTUALLY going to call Police and report themselves or a 11 year old?????? I was one, a 8 year old damaged my truck to the tune of $486. Do I turn in a 8 year old or let Daddy pay to fix my truck????? FACT: Deceased Mike Denardo told many folks and Councilmen, Fillingame told him to ignore golf carts!!! Do we need a grant to observe, stop and ticket violations 365/24/7 now or just plain ole patrol observations do???? Again, I will donate $100 to Alice Moseley Museum if the Chief can produce, other than Rod Ward, 15 golf carts tickets/citations issued by Bay PD from 2009-2017 when my term ended…… I am Lonnie Falgout and I wrote this.. I did receive 4 Tickets for no tag etc….. Mine were on a 2nd Saturday. I feel that it was selective enforcement by Team Rafferty and Filingame. There were no less than 15 carts passing me in the 52 minutes I was held up, all without tags and there were no other citations written that day for this. I, for one, am for the golf carts. It was my understanding Rafferty was not able to get it approved for various reasons I’m sure of no fault of his. None the less he continued to enjoy his golf cart riding while I had to park mine. That is the problem with no legal rule….it creates opportunity to selectively enforce. Fortunately these two hombres were shown the door. THOSE TWO HOMBRES ARE GONE-SO YOU PICKING AND CHOOSING! My main concern here is the safety of these little ones who have no say as to whether they are protected by their parents or other adults in their lives. This is precisely why we pay taxes to provide security for them such as police to step in when their safety is at risk when those adults fail them. If we all continue to fail them, they don’t stand a chance, and this lack of regard for rules and laws will be perpetuated by them for their own children. Our city officials in both the Bay and Waveland need to decide if they want to be part of the solution or continue to be part of the problem. It’s not rocket science. This isn’t just an Old Town problem. Children driving around in Ward 6, where the grass is high on the corners, is a fast growing problem. We’ve had several near misses involving drivers under 13 vs pick ups! Heard that too. Parents have to be held accountable. Children driving golf carts is extremely dangerous, they have no concept or ability to watch where they are going and abide by the laws. Shame on the parents, who should be cited by Child Services for their neglect on safety of their children. What I have also witnessed is the child endangerment by parents who ride in Golf Carts and hold infants in their laps. What is happening to this City?? A Cart should have the same safely standards of a car, truck etc. Hey, it’s just one person’s opinion, and take it for what it is worth, but those arguing about golf carts sound like petty (and incorrect) whiners. I don’t mean to suggest that children ought to be allowed to drive carts, with childish abandon and without restriction, but alleging that anyone and everyone can operate carts with abandon except for a couple of targeted individuals sounds like BS. I’m going to guess it sounds like it BS because it is BS. I’d suggest finding a more important problem that needs solving, but hey, sound as silly as you wish. Name me just ONE thing more important than being proactive in the safety of children. Just ONE! I’m all for child safety, but name ONE child, just ONE, that has been unquestionably injured (beyond normal childhood learning-lesson bumps and bruises) operating a golf cart in this area. Now, before anyone goes off the charts, no, I cannot, for example, name a single child injured recklessly piloting a 747, and no, I do not advocate children flying aircraft until one is hurt, and yes, children should not be allowed to do a whole host of things inappropriate for children. All that said, what does that have to do with select ADULTS being allowed to operate carts while other ADULTS are condemned for it? A lot of the folks here lose all credibility with the average person by coming across as screaming loons. I’m just trying to focus the invective and outrage on things that are more suited for the focus of such. Enjoy your commentary, Nunn. Always thought provoking. On this subject: The police DO TICKET underage drivers. Whether or not they ticket as much as they should is another story. The real issue is the overall policing of the Wild West better known as downtown BSL’s beachfront. Golf carts are just one of the many issues. While public safety should be a priority, it has to be a delicate balance for the city and police to maintain in the current environment. People like their party palaces, their golf carts and their freedom. Too much “policing” downtown and the public and business owners will be up in arms over it. I don’t like seeing too many kids piled in a golf cart either. It’s not okay. Just like I don’t like seeing kids piled into the back of a truck speeding down the highway, but it people still do it. What happened to Rod was selective policing. No question. Hopefully, that sort of policing has stopped. It’s possible the new chief will have his officers crack down on blatantly unsafe uses of golf carts for transport. Like adults swirving all over beach Blvd. while texting and more. Time will tell. Well stated LC. Last night I saw two older women driving a cart at Beach and Main with a very small child sitting on the lap on the passenger. You shake your head at how dumb some people become when they get behind the wheel of one of those. OTOH last week I saw a good looking young family in a cart one block down that had proper child seats in the back with the kids actually secured in those seats so some people do get it. Why are so many people in Hancock County so ready and eager to run everyone else’s life? Can’t you be content just running your own life? You know, I’ll bet you do plenty of things that somebody doesn’t like. Jesus. Anytime something is allowed but not legal, the issue of selective enforcement is going to be there. I for one am not overly concerned with the usage as it is but good ole common sense enforcement is always welcome. My situation was blatant. My wife and I, at 2:00 in the afternoon on 2nd Saturday at the corner of Beach Blvd and Main Street, were pulled over breathalyzed and detained for 52 minutes because I wanted a breath test not the BS physical test. He did not have a breathalyzer in his vehicle and demanded I take the street test which I could tell was going to be a fail based on his attitude. I passed the breath test then he proceeded to write any all tickets he could then when we were in court Rafferty wanted to prosecute to the highest extent of law as possible. The Judge said does this mean that my son and I cant take a golf cart ride anymore? $1600 later I was cleared. Selective enforcement can and will happen till we have a legal guideline to follow. I do not ride my cart as I have first hand experience and know this. Again, now that the Joker to the left and the Clown to the right are gone the streets are much safer for good citizens. Rafferty is still around? What happened to throwing the bastards out and draining the swamp last city election? He sure has lockjaw on that city government teat. 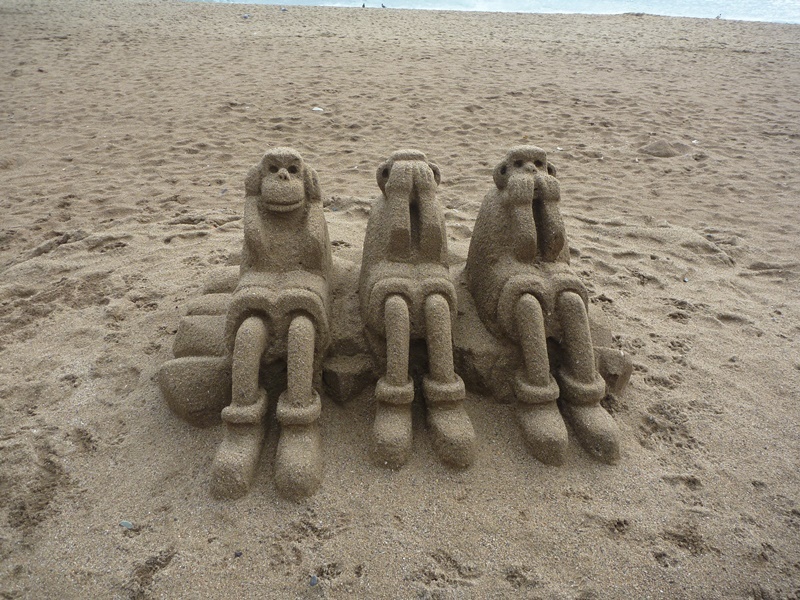 Previous Previous post: Special dedication….